The AAL Forum, which coincides with the Silver Week that Bizkaia will dedicate to the Silver Economy sector, aims to expand the AAL community of change makers and develop more efficient systems which will allow us all – local stakeholders (municipalities, provinces, regions, health and social care providers, etc. ), SMEs and the industrial sector responsible for planning tomorrow’s digital technology today – to build the services for an ageing society together. 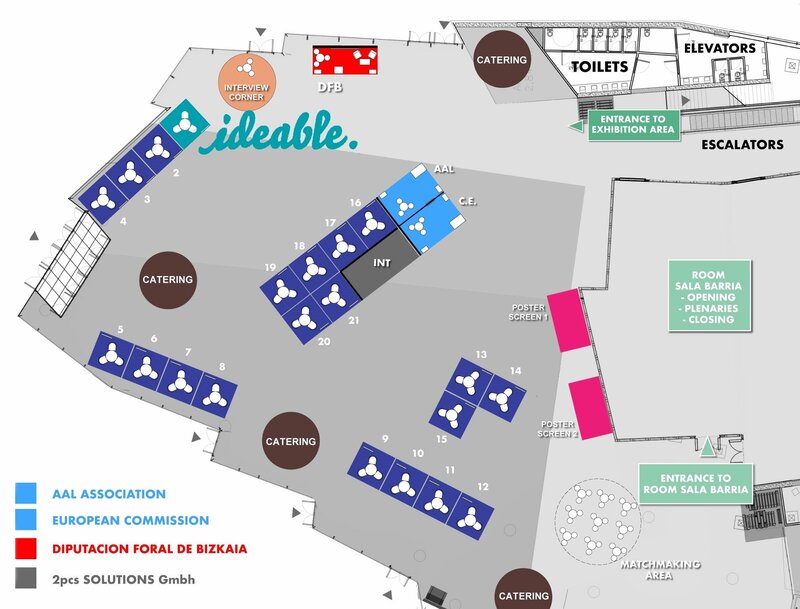 As part of this event, Ideable will have its own stand where we will present our Kwido elderly care platform, as well as various innovations in this field that we are currently developing in the areas of cognitive stimulation, indoor and out-of-home monitoring for the elderly, virtual reality, etc. In line with the AAL Forum’s objective of creating an interactive and inspiring event based on creativity and a commitment to the AAL community, our newly developed virtual reality games for cognitive stimulation will be available to those attending the event who come to our stand. It will present zocaalo, the new international marketplace for apps available for the elderly, both at our stand and at a side event. The zocaloo workshop will take place on Wednesday, September 26 at 11:00 am in Room C Level 3 of the Euskalduna Palace. Furthermore, Iñaki Bartolomé, CEO of Ideable Solutions, will participate in Workshop 10 – Growing the AAL market: ensuring effective deployment of real life solutions on Tuesday 26th at 16:00 pm. The workshop will analyse how to contribute to the market success of AAL and Silver Economy solutions. In the poster section, Iñaki Bartolomé will also present the first advances of the IOANNA project on Tuesday, September 25 at 9:40 am, focused on offering geolocation products and services to the elderly from mobile phones. In addition, prior to the AAL Forum, our CEO will also give a presentation about zocaalo to hackathon Hack4Elder advantAGE participants on Sunday at 11:00 am. AAL is a European programme to promote research into the use of technology to improve the quality of life of the elderly. One of Ideable’s most distinctive characteristics is innovation, as it has already demonstrated in several of its projects. Examples of this are the creation of the elderly care line (Kwido), which is now a benchmark in Europe, and the digital cognitive stimulation platform (Kwido Mementia). Ideable is very active in the Silver Economy sector and in the AAL programme, taking part at present in four different AAL projects with partners all around Europe. And Ideable was also chosen to design the event’s website, so we couldn’t be more involved or happy for it to be a success. Come to the event and don’t forget to visit our stand!